Many years have passed since the last edition of the present book was published. The discovery during this period of many new reagents has resulted in a vast accumulation of data on their application and made this completely revised edition necessary. Numerous new tests and various new chapters have been added. Chapters 3,4 and 5 of the fifth edition have been combined into one chapter, which is divided into sections devoted to the elements. These sections are arranged in alphabetical order to make for easier location of information on a given element. To further improve the usefulness of the volume, a reference list has been provided for each sub-section followed by a biography of the appropriate quantitative methods. Development, present state and prospects of inorganic spot test analysis. 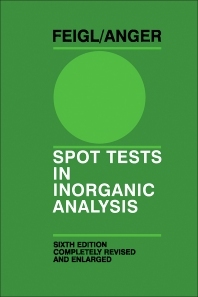 Methodology of spot test analysis (completely revised and enlarged by Dr. G. Skalos). Preliminary orientational tests. Tests for the elements, their ions and compounds. Application of spot reactions in tests of purity, examination of technical materials, studies of minerals. Tabular summary.